If every mistake you ever made followed you for the rest of your life and was posted online forever for the world to see. In the eyes of others, your digital self defines the real you. To protect our online safety and privacy with the tools and information you need. Catching mistakes before mistakes catch you. A better future for the many communities we serve. Add your voice and help. Communities working together for a better future. Safety and Privacy Tools for Everyone. Working with local residents and businesses. Our lives are exposed online more and more. Protect you home and your business. Founded to help protect people online, the Institute for Internet Safety now serves all residents and businesses in your local school district. In addition to our online safety advocacy and oversight, our programs help to educate, analyze and manage the online presence and reputation of the communities we serve. Your generosity makes our work possible. Whether you're contributing financially, becoming a sponsoring business or volunteering, your help makes a difference. 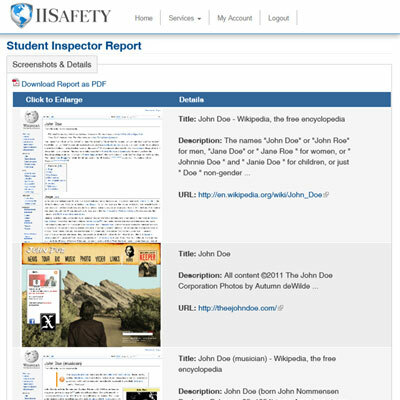 The Institute for Internet Safety was founded by a group of concerned professionals who realized that the tools they were developing could be helpful to everyone. A nonprofit, 501(c)(3) charitable organization was created to put these tools and services in as many hands as possible. Our board of directors carries on with this mission, and we welcome you to join us. Reports are available to members. See what is posted online in minutes. What is being posted by you and about you? What is being posted about your child or business? Email notification when your new reports are ready. Checkup on yourself or your business, or use to "be present" in your child's online life. First, fill out the form with the info we need to run our searches. 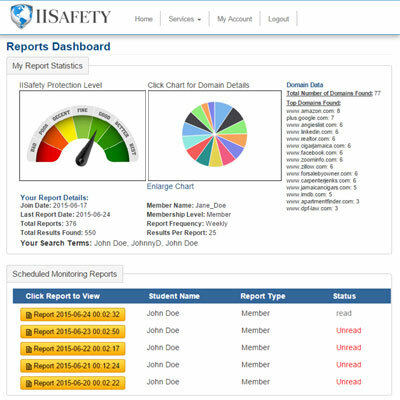 Then, go to the Reports Dashboard to view statistics and reports. 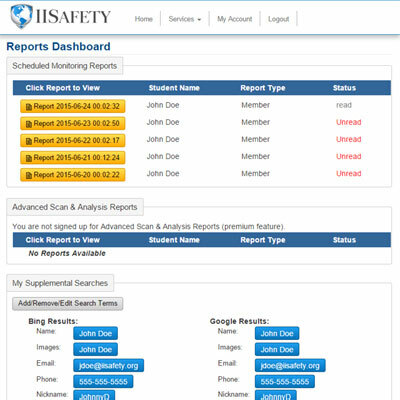 The "Scheduled Monitoring Reports" section contains your reports. 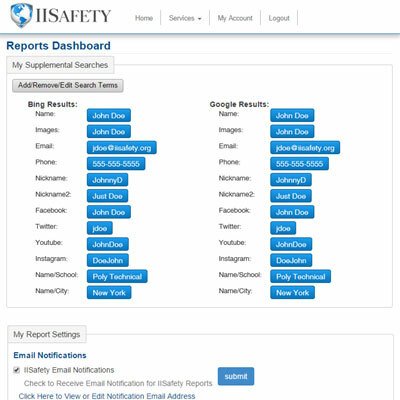 Open a report to see the detailed information on everything we found. Supplemental Searches add versatility and depth to our reporting. 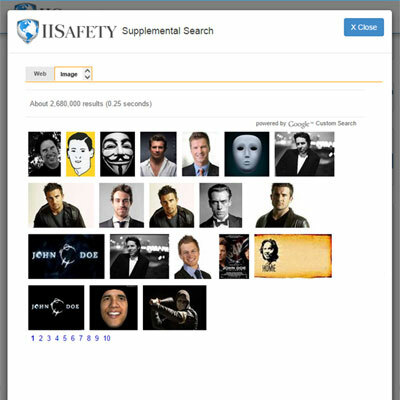 Image, social media and other advanced searches all for Free! The Visual Web Scan report provides insight into your online reputation. 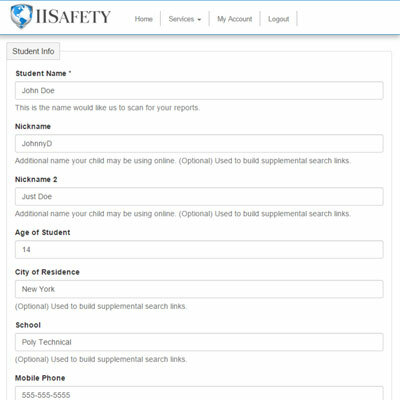 Simply put in your name, your company name, or your child's name (and any other information to be included or excluded to help get a better result) and our software will search the web and report back to you on what is found. Our Port Scanner will check for weaknesses in the privacy settings of your network. Hackers probe the internet for ports - the 'doorways' they use to access your computer. If they find an 'open' or 'closed' port they try to hack their way in. The best result is 'stealth' - they don't even know your port is there. Our Browser Leak Test shows you the information websites can pull from your browser when you visit them. It is incredibly detailed by default. This information is often used to create a 'digital fingerprint' so that advertisers and other data tracking companies can follow you even when you think you are browsing privately. for children, families, the vulnerable and disadvantaged. Whenever possible, we will not collect or store your private information. We do not not sell, share, rent, trade, barter, swap or otherwise disclose your information to any outside party. Every day there are stories in the news of people whose lives are forever changed. The Institute for Internet Safety is a recipient of a Google Grants award. The Google Grants program supports registered nonprofit organizations that share Google's philosophy of community service to help the world in areas such as science and technology, education, global public health, the environment, youth advocacy and the arts. The Institute for Internet Safety is a recipient of a Microsoft Azure Sponsorship.